There are only a few “celebrity” books that I use on a regular basis: Bouchon, by Thomas Keller, Mustard’s Grill Napa Valley Cookbook, by Cindy Pawlcyn, and a few of the books by Alice Waters of Chez Panisse fame. Otherwise, I tend to stick with compilations. The point is, most of this type of cookbooks are just recycled recipes, or so complex I don’t want to bother with them. 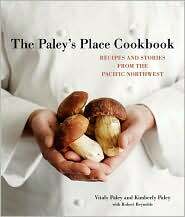 However, The Paley’s Place Cookbook – Recipes and Stories from the Pacific Northwest, is one that I am likely to keep close at hand. The book starts with a rather charming essay by Vitaly Paley about his immigration to the United States, how he met Kimberly, their romance, and his general philosophy of cooking. Both are emotional engaging writers, and the book is filled with little vignettes about ingredients, philosophy, and cooking methods. Kimberly is so good at painting a picture, I found myself wishing she had a few more essays in the book. However, her voice does continue in limited form, as she recommends an accompanying wine after most of the recipes. It is no secret that I have always been a fan of Paley’s Place, and I was pleased to find many of my favorite dishes in the cookbook. Include are old favorites like Escargots Bordelaise with Roast Marrow Bones, Roast Duck with Cherries, Summer Green Bean and Grilled Peach Salad, and Gazpacho – which is strangely enough identical to the recipe I’ve been using for years. I’m not sure if that makes me a great cook, or Vitaly a lousy one. There is a wide selection of desserts, including an excellent Tres Leches Cake and an assortment of cookies. The book finishes with a selection of cocktail recipes, including their famous Lemon Drop. I’ve already made several dishes, and have been very happy with the results. On a recent rainy evening, I tried the Curried Butternut Squash and Pear Bisque, which is much better than the recipe I’ve used before. Last night, Duck Wellington with Mole Sauce – “A madman’s Wellington with mole” made it to my table. The latter recipe is not something many casual cooks would normally try, but Vitaly gives very clear directions that leave little to question. The end result is well worth the number of steps, and it really isn’t very difficult. At this point, I am ready to make an entire meal from the book, or replicate some that I’ve had at the restaurant. Most cookbooks of this genre fall into the trap of assuming the reader has a fair amount of cooking knowledge. A home cook may well be lost when they reach a step they know nothing about – “render the fat”? Though the directions are offset from the main recipe in the sidebar, the book generally tells you everything you need to know to bring a recipe to fruition. A few new (to me) techniques are thrown in – for example, grating tomatoes for gazpacho, why haven’t I thought of that? Overall, I’m quite happy with The Paley’s Place Cookbook. I like the way traditional French cooking methods overlay “new American” ingredients, with even hints of Vitaly’s Russian roots peeking through. This is a book that will make you salivate, and want to rush to the kitchen to try new recipes. I recommend it. Category: Authors / Book Reviews, Portland Food and Restaurant News and Discussion. Related posts about Paley's Place Restaurant. More about Kimberly Paley, Vitaly Paley. Vitaly and Kimberly are such perfectionists that it’s no surprises that the book is fantastic. They spent countless hours testing and retesting the recipes, writing the essays until THEY were happy with it. Vitaly is not a cheater like Stu Stein or some of those gigolos. When he invests himself in a project, let it be a dinner for a couple friends or a book, nothing will be left to good luck… He is the most serious cook in this town right now. By far. A great cookbook indeed. 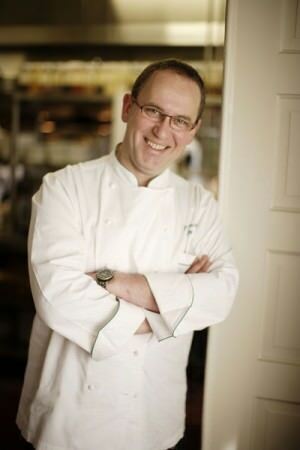 Robert Reynolds also played a huge role in this cookbook project, and is listed as one of the co-authors. Robert is a terrific writer, and I’m guessing lent a hand in that department. Kim & Vito are a class couple. They came to Oregon with a purpose and dream. Worked hard and I cant think of two nicer, kinder and considerate people who deserve this. Lots of restauranteurs should take note of their growth. Slow and steady, each year improving. I think of the first “Paley’s” and how it has morphed. I remember Kim & Vito sitting down with us wondering, ” should we buy the building” -Yeah they bought the building. I think of Vito showing me his new kitchen….FINALLY a real Chef designed toy chest. The proud smile on his face. I think of Kimberly taking care of my drunken self at IPNC trying to get me to eat, and slow down the drinking. My most fond memory of Kim & Vito was while I was really, really sick. Vito and kim coming to my hospital room . Bringing me soup and fruit and juice. Kim “feng shuing” my room for good spirits. They spent almost two hours in my room on a Friday afternoon!!! That valentines day, I was still in the hospital. ON VALENTINES DAY, Kim delivered Valentine day dinner for me and my wife to the hospital! I remember coming home from the hospital after major surgeory and KIm & Vito bringing me a beautiful dinner of salad, pasta, filet of Kobe, and two deserts! I remember my wife telling me that after spending hours with me in the hospital, Kimberly refusing to take money from her for her dinner, until I got better. Vito and Kim really put thought and effort in this book. Like everything they touch, they touch it with class and a lot of grace. One must admit, it is a beautiful book. By the way Kim, I am sending a copy to Eric Ripert for Christmas. Now I am busy with a new job and a budding wine brand. Kim & Vito you know who this is….dont give out my name, lets keep that on the DL. I love you both! Joyeaux Noel! Kim, I know your dad is smiling, and he loves the cookbook! Wow.. what a nice comment. What a lovely posting, Amoureuse, and so, so spot on. We’ve had the pleasure of knowing K&V since nearly the time that Paley’s opened and have so many wonderful memories of evenings spent there. All of the same love, hard work, and dedication that goes into their restaurant went into this book. It’s a wonderful collection of stories and recipes, many of which kindle such fond memories of the best that Paley’s has offered over the years. We too have appreciated both the steady growth and the increased recognition that has come with it and have been proud to be fairly regular (if not regular enough) customers. We’re looking forward to a great holiday dinner which will feature both the Onion Tart and the Tres Leches cake from the cookbook. We’ve also tried a number of other recipes from the book and absolutely agree that they nicely capture the essence of what Vitaly and his crew have created over the years. FD, thanks very much for highlighting this here. We hope that it continues to get all the recognition that it deserves. Dammit! Amoureuse made me get all misty at work! Great Stuff! I am so happy Vitaly and Kimberly and co. put out this great cook book. There are only a few Portland restaurant cookbooks out there, and I think theirs trumps them all. I have been cooking in Portland for 7 years, and when I first got here, my research told me that Paley’s Place was one of the best restaurants in town. After my 8 years of living here, that is more true that ever. 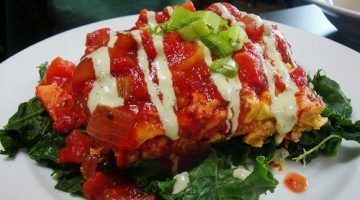 Within the chef and server circles of this town, it is pretty much agreed upon that Paley’s Place is one of the best, most innovative and at the same time most reliable and consistent restaurants in PDX. We all love a respect you, Vitaly! Also, thanks for letting me work in your kitchen for that summer of Sunday afternoons! Wow. I guess I’m gonna have to pick up this book! Being used to reading a lot of sniping and gossip and trash-talking on forums like this (and I don’t intend that as a criticism; it’s not a reflection of you, FD, or of your readers… just par for the course on the interwebs), I find it nice to read not only a post that celebrates two people who clearly enjoy and are devoted to what they do, and have given much more to Portland’s food community than they’ve taken, but also the genuinely heartfelt outpouring of appreciation in the comments section. Bravo to Vitaly and Kim (and all of the other great cooks in this town), and as well to Portland’s curious and knowledgeable eaters who’ve allowed them to thrive! It’s pretty incredible how much press this book is getting too. The Splendid Table featured it last month and I think it’s selling well at Powell’s. I love the good-food news whenever I can get it these days. I actually think Powell’s is out of it already! One of my cooks wanted to buy it and it was out of stock! Amazing and good for them!